"It is a crime against future generations to knowingly deprive them of the beauty and wonder we have inherited from generations past"
I grew up in Kensington, which is a very green community. Growing up, I went to Tilden Park a lot and have been skiing since I was four. I've always felt that the environment and natural beauty had inherent value, and, living in the Berkeley area as a little kid, the values of environmentalism and conservation were instilled in me early on. When I was in 5th grade, I saw An Inconvenient Truth by Al Gore. More than anything, I was puzzled by the incongruity between the severity of the climate crisis as described in the film and the poor international response. This was when I first realized that our environment was actually in danger, as opposed to merely some part of it being in danger. I understood the consequences of not acting, and was thus inspired to care. 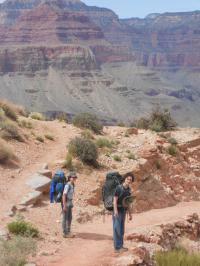 Also, last year, I went backpacking in the Grand Canyon, which was truly breathtaking to see in person. I have also been to Hawaii twice, which is one of the most beautiful places I have ever seen. These two trips have allowed me to experience the beauty of nature and see what we risk losing. At home, I recycle exhaustively and make a conscious effort to avoid unnecessary environmentally damaging activities. At school, I am part of the Environmental Design, Science, Engineering, and Technology (EDSET) program, where I have an internship at the Lawrence Berkeley National Lab. There, I study nuclear power. Through my environmental science class and internship, I am learning about environmental issues and ways in which I can take action. Understanding the science is very important to finding solutions. No particular teacher has really influenced my environmental values or behaviors, but my environmental science class in general has inspired me to make competent and intelligent decisions to protect the environment. I think it is important for everyone to know what is at stake so that people can make informed decisions on the topic. Everyone should be cognizant of environmental projections as well as consequences of action and inaction. So, it is important to read about and be aware of environmental issues in order to prevent the environment from being polluted and destroyed. I stay inspired because certain experiences, information, and places that exist today will not be accessible or exist for future generations, which greatly bothers and concerns me. I personally believe that knowledge, information, and nature are sacred, that they are characteristics of the universe, and thus the property and right of every sentient being, past, present, and future.